Ever wanted to buy MAC Paint Pots but not willing to shell off 18 bucks from your wallet? Well, here comes Maybelline 24 Hour Color Tattoo! 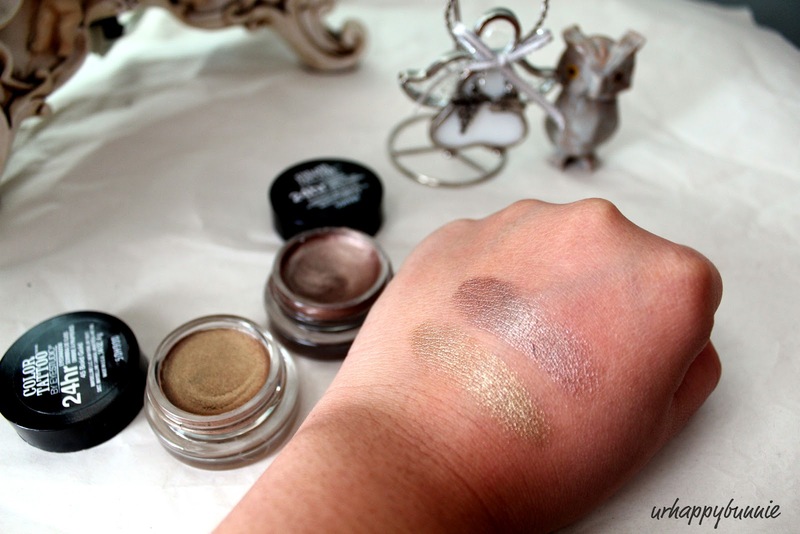 A drugstore cream shadow that is very similar and comparable to the MAC Paint Pots. There are 10 pretty vibrant shades of the Color Tattoos but I only got two of them. Since they are in the permanent collection, I am in no rush to get all the shades but they all look so wonderful. I have Bad to the Bronze and Glitzy Gold. First of all the color pay off is amazing. They are highly pigmented and creamy. 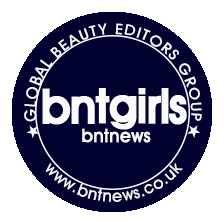 They blend pretty well upon application and can also be built up for more intense looks. What I love most about this product is when it sets after a few seconds of application, it stays put and doesn't crease throughout the day. I find that even without a primer the Color Tattoo is vibrant and long lasting. In fact, I even think it looks better without a primer under it. Though I'm not sure if this product really lasts for 24 hours, it is indeed long wearing. You can see a subtle fading at the end of 12 hours and that is already a pretty long time for a drugstore product to stay on. You can use the Color Tattoo on its own or as a base, or even as a gel line since it lasts all day. As a base, this gives the shadows an extra boost of color but it is also beautiful by itself. I always use Bad to the Bronze by itself and I never had a problem. It looks nice and perfect when you're on a hurry to go and just needed color on your lids. I use my finger to apply and blend it but I also find that using a flat synthetic brush to apply it works pretty well too. Those two are gorgeous! I've heard their staying power really is worth trying them out for. Great buy! ooohhh those are amazing, gotta get my hands on those! Hi! I did say above that it lasts pretty well throughout the day though I can see a little bit of fading by 12 hours. Nothing too serious like it disappearing from your eye. I'm not sure if it does last 24 hours since I don't wear my makeup that long but it is really long-wearing. I have all but the pink, teal and orange. They are great!!! I have Bad to the Bronze and I love it. Thinking about maybe getting the gold one now :) great review! Such pretty colours! Love it! Great!!! beautiful colour, specially the bronze one. Looks really good!! & lovely post, i've wanted to try these out but unfortunately its not out in the UK but i hope to grab my hands on them soon. So far, all I have is Tenacious Teal. It's good to know they're permanent, so I'm looking forward to get more. :D The colors you picked out are gorgeous. I'm on the lookout for the bronze or gold one. Our Walmart is sold out on them. Thank you so much for leaving a comment on my blog and for following me too. :) New follower here. Hehe... :D As for pink eyeshadow, as pretty as they are, it's too bad it gets washed out in pictures. Hopefully there's a solution to that. Aww thank you! :) stop by anytime. Thanks for checking out my blog hun! I'm following you now. I've been wanting to try this product really bad. It looks like it's gonna work as well as MAC paint pots! Beautiful shades. I am not sure if this is available in Canada but if so then I definitely am trying these out! Nice colours, are they pretty long lasting too? 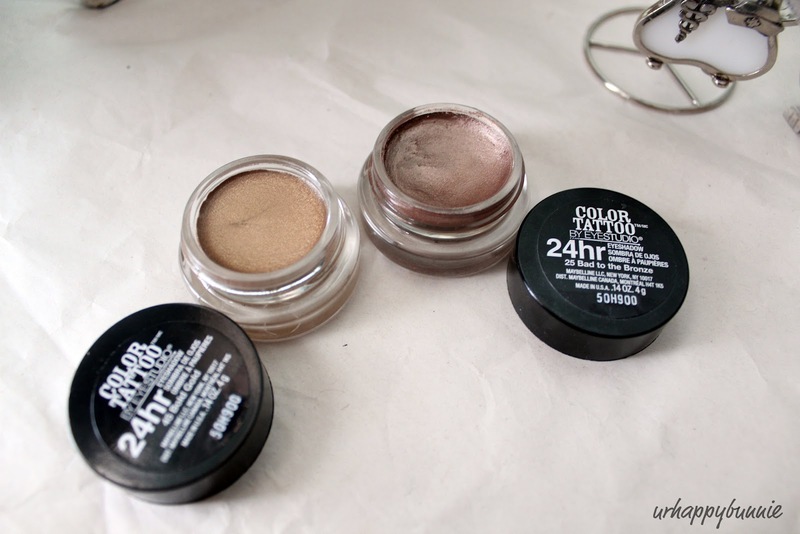 and these color tattoo cream shadows are perfect, hope i can find them in turkey soon..